Allow me to introduce the David Weeks Cubebot. There are several Cubebots to choose from, including small Cubebot, medium Cubebot, and extra large Cubebot, as well as his cousins Julien Cubebot and Guthrie Cubebot. David Weeks makes all kinds of cool wooden toys that are great for tots and grown-ups alike. We love toys that are NOT made out of plastic. He also makes hilarious gorilla shaped ashtrays. Check out all of designer David Weeks’ products here. I think I have a new favorite Thomas Wold Project. 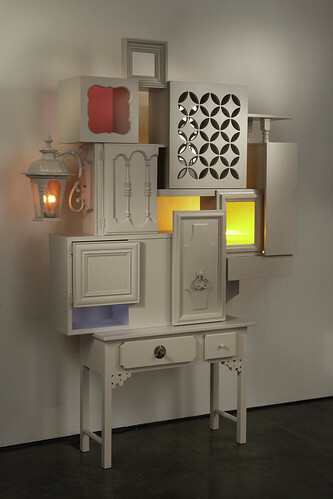 The exuberant light and color this assemblage is emitting adds a whole new level of fun to his work. I love seeing the pieces before Thomas puts them together and have this mental image of how his mental images work, with pieces of tables and cabinets and door and legs swirling around, landing in different compositions, then moving again. Check out this post on his blog and you’ll recognize an element or two. Thanks to Thomas for posting this in our Fresh New Spaces Group! O.M.G. I received this special People magazine extra thing in the mail the other day called “Stars at Home.” I flipped through it and was pretty bored, until I came to the last page. There I spied the most magnificently horrendous home accessory I’ve ever seen. I wish they sold this at Cost Plus World Market or something, because I think I would give it as a wedding gift at every wedding where someone has made me wear a bridesmaid’s dress. It’s the Michael Bolton (long flowing locks version) bust. I can see this in a dining room next to busts of Beethoven, Bach, and Weird Al Yankovic. Can you imagine two massive versions of these flanking a front door? I mean, he has the same mane as a lion. Forget Foo Dogs – every time I look at this I think about the Michael Bolton in Office Space and what he called other Michael Bolton, which is not fit to print.